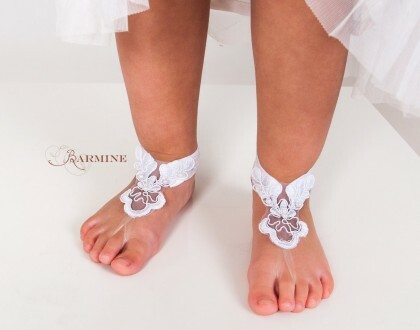 These gorgeous french lace girl's barefoot sandals are made from a delicate lace with elastic around the ankle. Your Princess will look absolutely amazing wearing this foot accessory! Perfect for non walkers and for older girls. Nice as a shower gift, Christening accessory. You may want them for your flower girl during the beach wedding or just to make nice pictures! This foot accessory is made with elastic band around the ankle. I could make them to fit your feet according to your shoe size. Please contact me if you need any help. The sizes listed are US kids shoe sizes.